Medieval knights, samurai, and vikings; some of the greatest warriors of history. All equally powerful in their own right, but never in the same time period to truly see who was the better fighter. Now these warriors are placed into combat and are set to fight one another until one faction is left victorious. It doesn’t make sense for these distinct factions to be fighting for control, but it doesn’t really matter. They’re fighting, it’s cool, and it’s brutal. At its best, For Honor lets you live these fantasy fights to their absolute fullest. For Honor’s setup can be both strange and stupid. The campaign attempts to make sense of it all, including a plot device that forces these factions into continued combat. A novel idea with some good moments that just ends up feeling more like a tutorial to the multiplayer. I will say that the campaign gives you a chance to play each class and net some experience, so be sure to try it out. The combat system is easily the biggest highlight here. For Honor is a 3D action/fighting hybrid brings its own creative style to the multiplayer scene. The warriors each have their own unique weapons, like spears, battleaxes, and katanas, but the fundamentals remain the same throughout. Each warrior can hold their weapon in three directional positions, for both attacking and defending. Combat is as simple as locking on to a target and moving the right analog stick. Add in parries, throws, and unique skills, and you have robust combat skill list. Battles are intimate and thought provoking. Most encounters will have players faced against one other foe in the middle of a heavy battlefield. These encounters require patience, asking the player to outthink their opponent. Button-mashers quickly run out of stamina, leaving yourself open. Button-mashing also gives opponents a better read on you so be mindful on each movement. Moment of tensions arise as you and your opponent slowly circle one another while switching stances, waiting for openings. This is where For Honor shines, where each engagement will mean life or death. Things become more frantic in the Dominion mode, where teams of four earn points by taking objectives. Outnumbering the enemy is commonplace here, so be sure to stay close to an ally. If you’re caught between more than one foe at a time, For Honor helps even the odds. 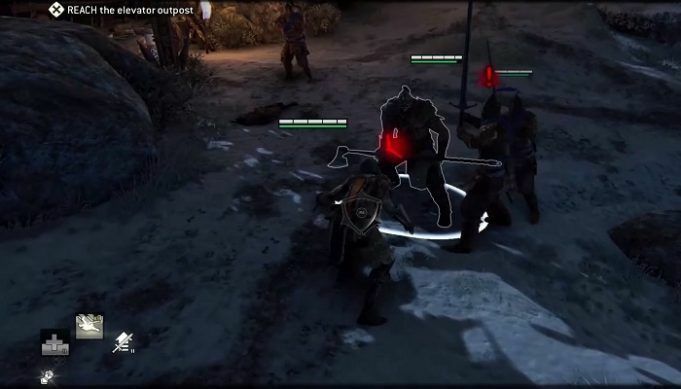 Players can block incoming attacks from several directions allowing the outnumbered to fill their revenge meter. Once activated, it can knock enemies down, giving players a chance to fight back or escape. Being able to overcome these moments create some of the most satisfying things about For Honor. Even though each character share basic movements, don’t expect to jump between with ease. You need to spend time with each class before you’ll find one you really like. Early on, I used mostly the Knight Warden and later found myself using the different Samurai classes. The more you play with each character, you will being to level them up and earn better gear. The stat boosts don’t really change the game all too much, but increased stamina and defense is always nice. You can earn these through multiplayer matches and buying blind packs using in-game currency or real currency. In-game currency can be earned through matches and daily missions, but earning this is a slow process. A typical match of Dominion nets you about 30-40 currency and you’ll need 500 to open the best blind boxes. It’s gross to see so many options for microtransactions, but it just seems to be mandatory at this point. At least it’s only optional, so players with no interest can just ignore it. https://www.youtube.com/watch?v=cBzhMK22XRs Ubisoft has big plans for For Honor in the months ahead, with their own faction wars metagame, season pass, and additional characters to join the war. For Honor has the setup for something much bigger, but that all depends on how much you enjoy the gameplay. Although, For Honor flourishes, I have spent enough time in the beta before launch to feel like I’ve seen enough of the game to last for a while. It’s a solid experience, but most of it depends on how much you enjoy the game. If you’ve played the beta, and need more, For Honor has plenty in store for you. All and all, For Honor is a good experience that feels original and distinct. A tense, tactical brawler rewarding anyone with patience and willingness to master it. However, the overall appeal relies on how much you enjoy the multiplayer. If you have run your course through the beta, there’s nothing more to see here at the moment. 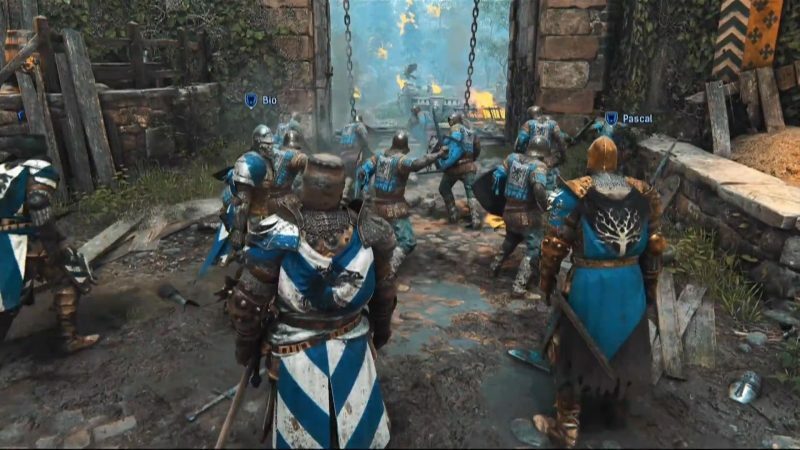 If you can’t get enough or are just looking for a new kind of multiplayer game to enjoy, be sure to give For Honor a shot.